I recently added a Millet adjustable rear sight to my 1911 .22 conversion kit. When I shot it with the new sight, it was shooting high, even with the sight adjusted to the lowest setting. This meant I would have to raise the front sight. Here is the rule of sights; adjust the rear sight in the direction you want to bullet to move. Adjust the front sight in the opposite direction you want to the bullet to go. Since my rear sight was at the lowest setting, I would have to raise the front sight to lower the point of impact of the bullet. Since the front sight was cast into the aluminum .22 conversion slide, I would have to mill it off and install a dovetail front sight. Refer to my article Milling a Front Sight Dovetail. My reference books told me that for the Millett series 100 adjustable rear sight Colt Custom Combat Lo-Profile with white dot I would need a front sight that was 0.275" high. I found item number 257239 at Midway USA “Novak Front Sight Blank 1911 Novak Cut .075" Depth .295" Height .125" Width Steel Blue” which is 0.295 inch high; more than enough for the job. I really like front sights with a green fiber optic rod. This makes the front sight easy to see; for me. 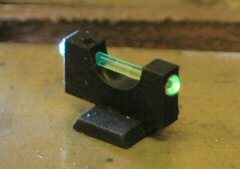 Midway sells a number of fiber optic front sights from $25.00 to $30.00, but the Novak front sight blank was only $17.00. Since I had some green fiber optic rod left over from other sights, I converted this blank into a fiber optic front sight. I leveled the sight in my machinist’s vise making sure the bit wouldn’t touch the ends of the vise. Then I took a 5/16” ball end bit and milled out the center of the sight. This allows more light to enter the rod. I rotated the sight so the end was up in the vise. I took a 1/16” square end bit and plunged a hole in one end of the sight. I turned the sight over and plunged a 1/16” hole in the other end. These holes will hold the fiber optic rod. I cleaned the sight with acetone and cold-blued the area that I milled. I cut a green fiber optic rod to the proper length, installed it in the sight, and ballooned each end with a match. Now the sight is ready to be installed. I found a source for 1/16" fiber optic rod on the Internet from Oakridge Hobbies and Toys. I purchased a package of red and green fiber optic rods; each package comes with ten, 10" rods for a total of 100 inches per pack. That should last me for years!